Acupuncture meridians are called many names. These names includes Chinese meridians, energy meridians, and Chi meridians, just to name a few. These meridians carry the energy that vitalizes all life forms and allows them to flourish and grow. Different cultures call this life force by different names: Chi, subtle energy, Prana and vital energy to name just a few. Similar to electricity, this energy is invisible to the human eye. However, experienced Chinese doctors can feel and trace these pathways of energy with their hands. About 5,000 years ago they mapped these meridian lines. With this understanding, acupuncture was developed to balance Chi. 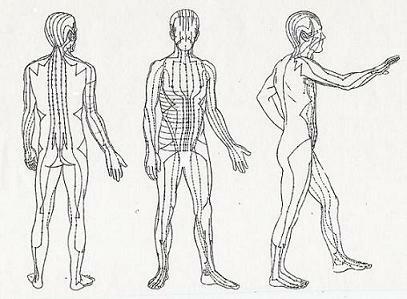 Think of these acupuncture meridians as streams or rivers flowing with energy or information. Like a river that provides life-giving water to its surrounding areas, these channels distribute revitalizing energy and carry information to the surrounding area of the body. Sometimes, however, the flow of energy is disrupted. An overload of energy in the form of strong emotions and trauma can block or disrupt the flow of Chi. It is like a surge of electricity going to your TV and causing a circuit to blow. Optimal health depends on energy consistently flowing; balanced, free, and uninterrupted throughout the entire body. You can also think of it in terms of an information current or download. If the data size is too large, and your computer capacity can’t handle it, the download is very slow or gets stuck. This is where Emotional Freedom Techniques (EFT) comes in. Practicing EFT will help clear the stuck energy from your acupuncture meridians. Allowing energy to once more flow freely to all parts of your body. Go to EFT Tapping to learn more about this amazing meridian tapping technique. Acupuncture meridians can be found throughout the body. There are many acupuncture points along these meridians that serve as energy reservoirs where energy is collected over time. These meridian points can be stimulated with needles, physical pressure, or tapping to release or redistribute this energy. There are 12 primary acupuncture meridians. These channels surface to the skin twelve separate times and appear to be segments. However, under the surface, these meridians interconnect with one another. Each one is named for the primary organ or system they distribute energy to. Two pathways, called the central and governing meridians, are considered meridians as well, even though they do not correspond to a particular major organ system. Each Chinese meridian has a time period where its particular energy is strongest. They are also associated with specific emotions.